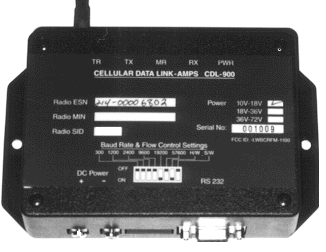 The Data Connect Cellular Data Link 900, CDL900, is a self-contained unit that uses Advanced Mobile Phone System (AMPS) cellular network for data transmission. AMPS is the cellular system used in North America, Latin America, Australia, New Zealand, and parts o Africa. AMPS system is not compatible with the GSM System used in Europe and Asia. The Data Connect CDL900 has an RS232 interface and supports the popular AT Command Set normally associated with modems. The DCE CDL900 uses non-volatile memory to store the configuration. Therefore, the CDL900 does not require configuration startup. The requirements to operate the DCE CDL900 are a host PC with a terminal program like Hyper terminal, program, Procom, etc. and MIN and SID information from your Cellular Service Provider. The DCE CDL900 is packaged with an antenna, flat RS232 cable and manual.